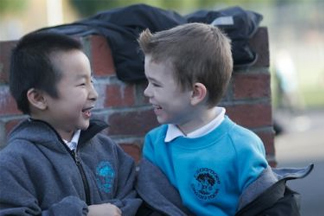 Integrated Schools differ from other schools in Northern Ireland by ensuring that children from diverse backgrounds are educated together every day in the same classrooms. Through their Admissions Criteria they enrol approximately equal numbers of Catholic and Protestant children, as well as children from other religious and cultural backgrounds. It is important to note that Integrated schools are not secular but are essentially Christian in character and welcome all faiths and none. In Integrated Primary Schools Catholic children are offered Sacramental preparation at P4 and P7. At the same time, Protestant children can generally avail of the Delving Deeper programme to develop their own faith knowledge. Integrated Education aims to provide children with a caring and enhanced educational experience. Empowering them as individuals is a priority for staff so that as they grow and mature, they’ll be able to affect positive change in the shared society we live in. If you’d like to learn more about the core principles of Integrated Education, please read our Statement of Principles.